I'll add a page like this for information on the various families I have researched. one to describe each family member I've researched. I will add various types of information on those pages so please go to the page named for the family you are interested in. The Cracker Home, home was built in 1863 by the Whiddon Family in Taylor County, Florida. It was purchased by my Grandparents, Daniel Washington and Helon Hendry Blue in 1909. Their children were raised in this home. 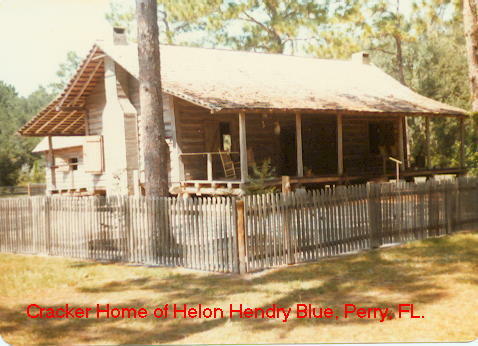 It now sits in a State Park in Perry, Florida as a representative "Cracker Home".